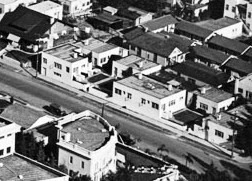 While researching for an essay on Irving Gill's influence on the evolution of modern architecture in Los Angeles I became fascinated by mentions of his Sherman Flats (aka Echo Park Flats) in the back matter of both the Kamerling and Hines books. Having never seen images of the project I dug a little deeper. Nailing down the exact location of the flats at the northeast corner of Park Ave. and Lemoyne St. via the historical building permits led me to the below photos which shed much light on Gill's progression. Sherman Flats, 1725-7 Park Ave., 1104-16 Lemoyne St. Irving Gill, architect, 1913. 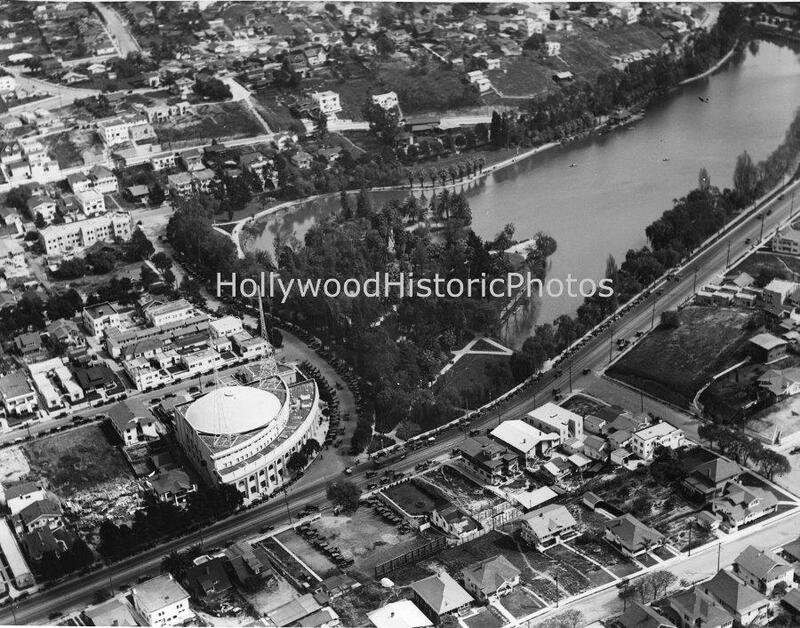 From Hollywood Historic Photos. The beginning of 1913 was arguably the busiest time of Irving Gill's illustrious career. While he was buried in work at the Industrial City of Torrance he was concurrently receiving commissions in Los Angeles. On January 27th, while in the middle of construction on a residence for Friday Morning Club leader Ella Giles Ruddy and just days before also breaking ground on the contiguous Sarah B. Clark and Myra N. Brochon residences, construction began on the eight-unit Sherman Flats Gill designed for entrepreneur and real estate developer E. Goodell Sherman. (For much more on Gill's houses for Myrah Brochon and Sarah Clark, his first Aiken System project, see my "Sarah B. Clark Residence: Irving Gill's First Aiken System Project." For more on Gill's Ruddy House see my "Ella Giles Ruddy House, Irving Gill, Architect, 1913"). 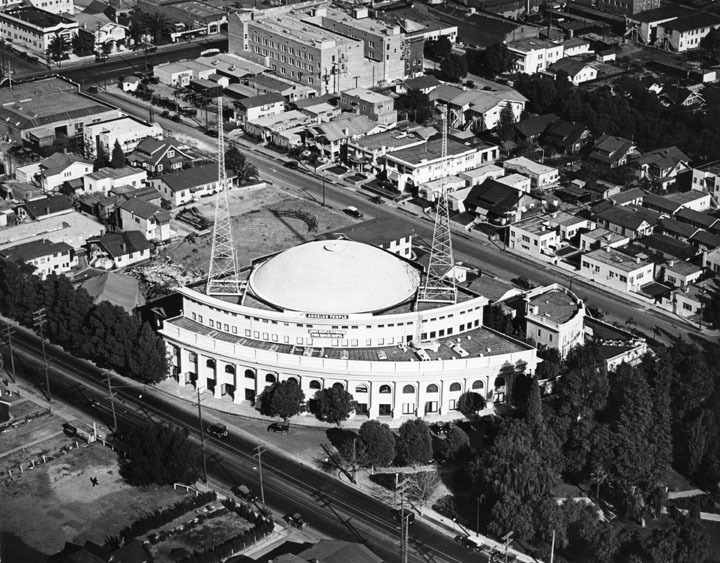 Center, Angelus Temple, 1100 Glendale Blvd., William Wheeler, architect. Dedicated New Years Day, 1923. Right, Flats for E. Goodell Sherman, 1725-27 Park Ave. and 1104-16 Lemoyne St., right. Irving Gill, architect, completed in 1913. From Los Angeles Public Library Photo Collection. 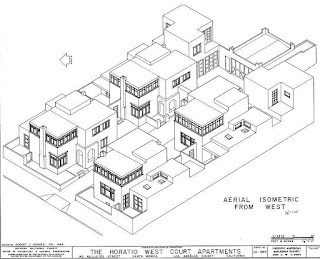 Building upon his 1910 Lewis Court work in Sierra Madre and concurrent workers housing experimentation in Torrance, the elegance of the Sherman Flats site plan is striking indeed. 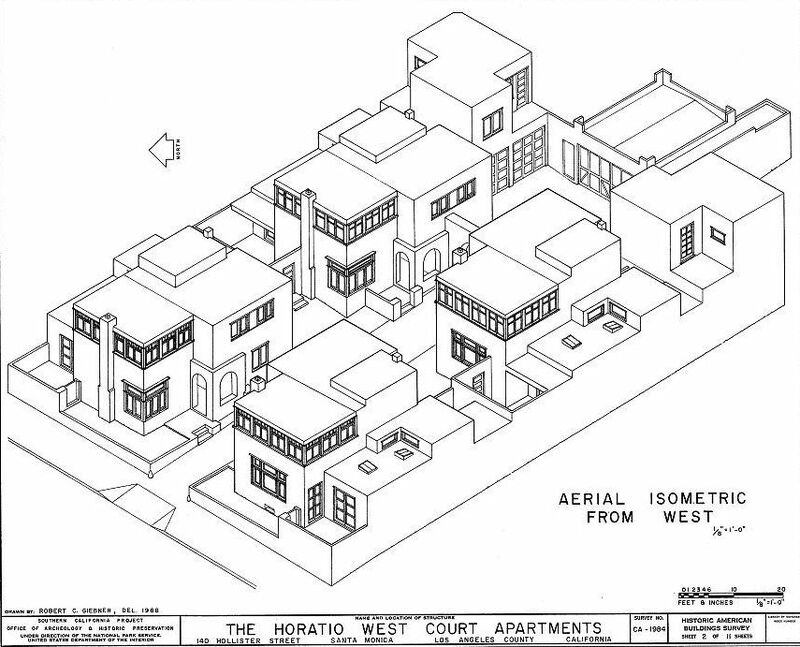 The project definitely presages his 1920-21 Horatio West Court in Santa Monica seen below. Horatio West Court Apartments, 140 Hollister Street, Santa Monica. Irving Gill, architect. From Historic American Building Survey, Library of Congress. Flats for E. Goodell Sherman, 1725-27 Park Ave. and 1104-16 Lemoyne St., right. Irving Gill, architect, completed in 1913. From Los Angeles Public Library Photo Collection. Angelus Temple, 1100 Glendale Blvd., William Wheeler, architect. Dedicated New Years Day, 1923. Left center, Flats for E. Goodell Sherman, 1725-27 Park Ave. and 1104-16 Lemoyne St., right. Irving Gill, architect, completed in 1913. From Hollywood Historic Photos. Evangelist Aimee Semple McPherson was also attracted to the intersection across the street from Echo Park Lake where in 1921 she commissioned architect William Wheeler to design her Angelus Temple across the street from the striking Gill-Sherman compound. 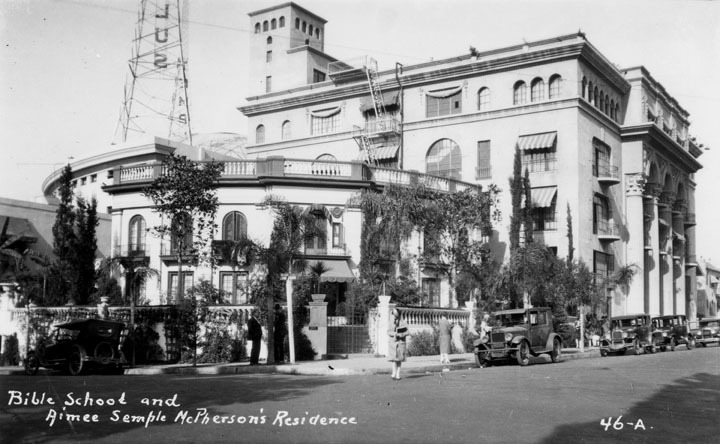 Fascinatingly, McPherson purchased the two-story Gill-designed flat located at 1112 Lemoyne St. across the street from her below Temple residence and had Wheeler do some interior remodeling in 1928. (More on the circumstances surrounding McPherson's purchase of 1112 Lemoyne to come later. Stay tuned.). (City of Los Angeles Building Permit No, 3253, February 3, 1928). 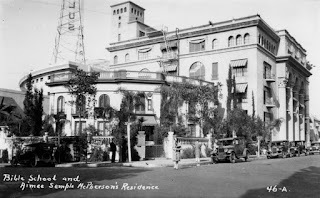 McPherson Residence and Bible School, northwest corner of Park and Lemoyne, Echo Park. From Los Angeles Public Library Photo Collection.